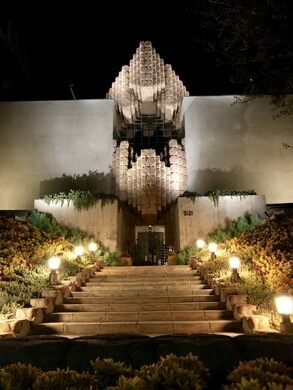 If the John Sowden House at 5121 Franklin Avenue in the Los Feliz section of Los Angeles, California, looks a little familiar, it’s probably because it was used as the home of Howard Hughes in Martin Scorsese’s The Aviator. Also, if you’ve ever seen it before, it can be a little difficult to forget because of its unique design. 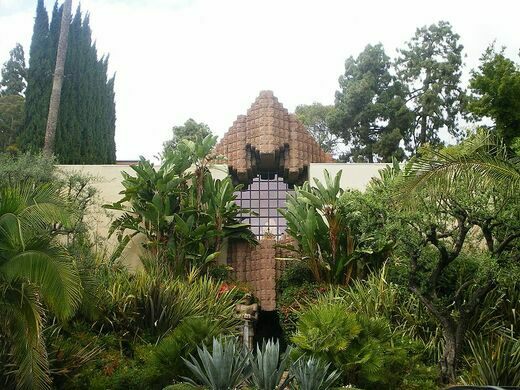 Designed and built by Lloyd Wright, the son of legendary Frank Lloyd Wright, in 1926, this Mayan-inspired home is often known as the “Jaws House.” It was the shape of the window, built using ornamented concrete blocks, which looks a bit like the mouth of a Great White Shark, that gave the house its nickname. 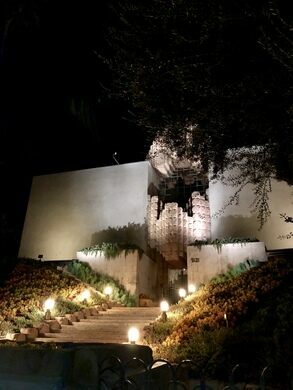 Much of the design here is influenced by Lloyd Wright’s father; you can see that he borrows the elder Wright’s early 1920s textile-block construction and Mayan themes. 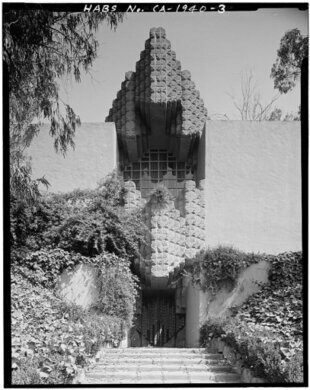 In addition to serving as the Howard Hughes home on film, the John Sowden House was actually once the home (from 1945 through 1951) of Black Dahlia murder suspect Dr. George Hodel. 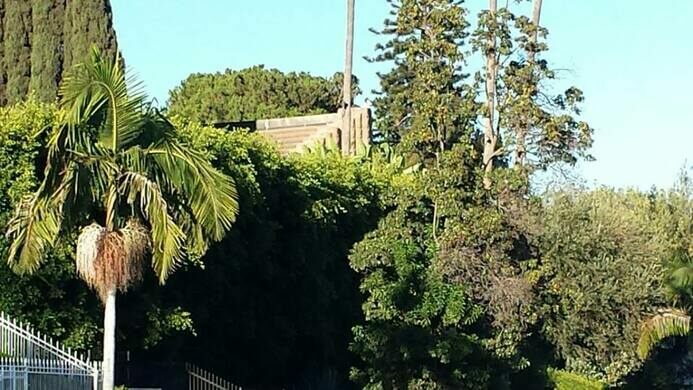 A Los Angeles physician, Hodel was not publicly named as a suspect at the time of the investigations, but his own son, a retired Los Angeles homicide detective, would later write that Hodel has tortured, murdered, and dissected Elizabeth Short inside of the Sowden House in January 1947. Long after either John Sowden or Dr. George Hodel lived in the house, it was renovated for new occupants. 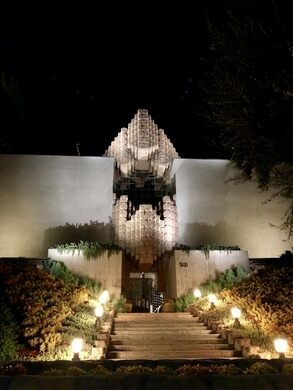 Designer Xorin Balbes purchase the home for $1.2 million in 2001 and then promptly declared it a wreck and spent an additional $1.6 million restoring it. With seven bedrooms, four baths, and about 5,600 square feet of living space, this was not a small undertaking. 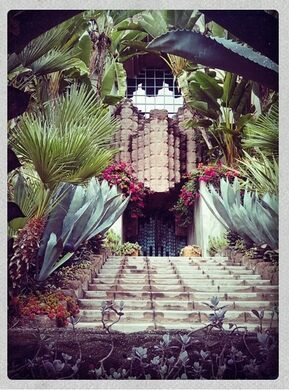 Balbes restored the stonework, converted the three-room kitchen into one, installed a pool and spa, and added new upscale bathrooms. Balbes also added enormous antique pieces, including an Indonesian stone Buddha, an antique Chinese dowry chest, and a 400-year-old Quan Yin statue. 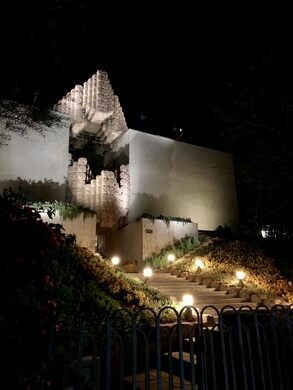 This historic LA park offers magnificent views and one of Frank Lloyd Wright's masterpieces.